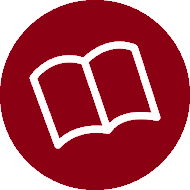 This section contains an overview of brochures and user manuals. You are interested in our appliances? But you do not want to order a brochure of our whole assortment? Why not use the benefits of MyBrochure and create your own individual brochure. You have the possibility to choose specific products which you are interested in. On each product detail page you have the option to put the product to the wish list. Therefore you just need to tick on the box for 'save & compare'. Now you can directly go to the wish list by clicking on the link 'To wish list' or you can choose more products which you can put to the wish list in the same way as before. If you would like to create your own individual brochure with your saved products, you just need to click on the wish list in the right corner of the Website. The number on the right side of the wish list link gives you the amount of products you currently have saved there. With a click on 'Add all products to my brochure' you start the preparation of your individual brochure. You can a customized the Headline, choose to add installation drawings und put in some notes if you want to. With a last click on 'Create and download brochure' you finish the creation and you will get your own brochure as a PDF file. 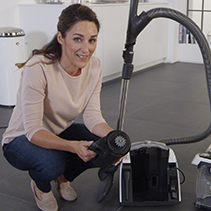 Tips on how to use a Miele bagless vacuum cleaner. Washing with Miele made easy! Tips on Miele wash programmes. Automatic dispensing with Miele TwinDos. Get more into your Miele dishwasher. A perfect coffee...No problem with Miele! Tips on the use of the Miele CM6. About 100 years ago washing was done by hand. But as early as the beginning of the twentieth century the first washing machines were developed and significantly simplified the daily routine of housewives. Since then, many technological innovations that represented fundamental milestone in laundry care have been developed by Miele. Here, in addition to interesting information on materials, we offer you numerous tips for stain removal and explain the meaning of the care symbols. Our wish is for you to have clean and stain-free laundry at all times! You have more than likely stood in front of a mound of laundry and asked yourself - what can I wash together and more importantly, how do I wash it? In most cases it turns out well, but occasionally there is an unpleasant surprise. Your favourite pieces shrank or became discoloured. 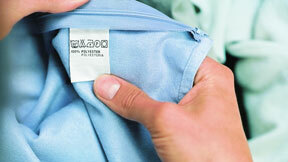 In essence, the nature of textile fibres determines their care. For this reason, certain ground rules should be observed. In this chapter we clearly describe the most important fabric types and their care so that you can start a programme in the future with peace of mind. Oh no! A stain. No need to panic. The guide to laundry care contains valuable tips on stain removal. Here you will find out what perhaps your grandmother always knew: how to remove stubborn stains. 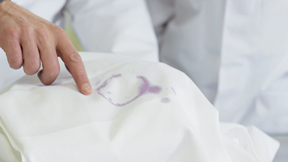 Unfortunately, we cannot guarantee stain removal without a trace, but we can assure you that you will always have a recommendation available on how to rescue your clothing. And perhaps the nerve-wracking stain will have a happy ending after all. 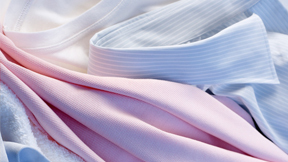 Whether washing, drying, ironing or dry-cleaning: there are signs and symbols for everything that convey certain dos and don'ts. Here we explain the most common care symbols of your laundry and clothing to you so that you can care for your textiles in the best possible way.